Marijuana use continued to climb among employees and job applicants in the first quarter of this year while abuse of opiates dropped, a drug testing company reports. Use of opiates or prescribed morphine and codeine dropped to 0.3 percent in the first quarter from 0.6 percent in the fourth quarter last year; marijuana use rose to 2.1 percent from 1.9 percent; cocaine use went to 0.3 percent from 0.2 percent; and crystal methamphetamine (ice) use remained at 0.9 percent, according to the Diagnostic Laboratory Services Inc. report released yesterday. There are certain trends, with marijuana apparently replacing opiates among substance abusers, said Carl Linden, scientific director for toxicology. "But what's disconcerting is the total positivity rate hasn't changed much," he said, noting that overall drug use remained at 3.6 percent of all employees tested. 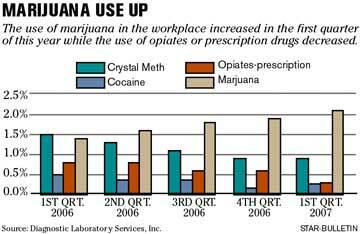 Diagnostic Lab has been monitoring workplace drug use since the first quarter of 2006. The latest figures are based on samples of more than 8,000 workers or potential employees from January to the end of March. The company does drug testing for about 700 local businesses. The only drug class that's problematic involves opiates, codeine or morphine, Linden said. "Most are prescription and probably many are legitimate," he said. However, "spousal sharing of prescriptions" is common and "technically shouldn't be done," he said. The opiate could be illicit morphine or heroin, which metabolizes to morphine, he said. Or it could be one of many prescribed products containing codeine, he said. "People can have prescriptions and abuse them. They can get them from multiple doctors." It may seem from the figures that illicit drug use is low in the workplace, Linden said. "But a lot of these are taken from individuals who know they're going to be drug-tested. So who knows what we're seeing under the water, so to speak, as an iceberg." He added, "It's good to look at them (figures) as trends or indicators, but obviously we're not catching all those who might be positive."